Luton Town boss Nathan Jones could make changes to his side as they look to reach Wembley with victory over Blackpool this evening. Hatters host the Tangerines in the League Two play-off semi-final second leg, knowing that only a win will do to either go through outright or take the contest to penalties. We’ll re-evaluate, move forward and whatever side we put out will be one who wants to win for Luton. When asked he if could alter the starting line-up that lost 3-2 at Bloomfield Road on Sunday, Jones, who only has Johnny Mullins, Cameron McGeehan and Danny Green on the sidelines, said: “Maybe, I wouldn’t want to name my team and do things now, so I ask people to respect that. Jones said: “We have to eradicate that, and that was the only frustration from the other night as I think we gave a good account of ourselves going forward. “It’s just defensively and especially after the half time interval, that’s what really cost us. “It was totally out of character since I’ve come here, not just since I’ve implemented anything, we did concede at Wimbledon last year, a few and Portsmouth this year, but our defensive record has been outstanding. 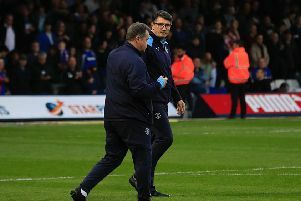 “Seventeen is what we’ve conceded away from home, so to conceded three in a play-off game is out of character, but that’s the beauty of these play-off games. “Anything can happen, nerves get to certain people and it’s how you handle it. Luton still have a fantastic chance of making it to Wembley to face either Carlisle or Exeter on Sunday week and on what it would mean to the side, Jones said: “It will be the culmination of a good season’s work. “We want to get promoted, this is the way we have to do it now. The fans we would take, it would mean so much not just to the club, but to the area. Despite finsihing in fourth place, Jones didn’t think Luton had any god given right to be Wembley-bound though, adding: “It’s difficult to say we deserve to be at Wembley, you have to earn that. “I think all this season we’ve earnt a reputation as being a certain type of side. It would be wrong of me to say we should have gone up automatically, because over the 46 games there were three more consistent teams. “On our day, we’re a wonderful, wonderful team, but we haven’t been quite as consistent as the top three to go up automatically. “Now we’re the best placed side in the play-offs and we’re a good side. Apart from the play-off game we hadn’t lost to anyone of them (top seven), so we deserve a place in the play-offs.